Novocortex contributed its expertise in marketing and business development to the U-specs project in 2005-2006. The project’s goal was to develop universal and affordable spectacles for people in non-industrialized countries, in order to improve their access to education and work. The project was initiated by the VU Medical Centre (VUmc) and the d.o.b. foundation. Novocortex was responsible for a business plan aimed to turn a product idea into a working prototype. The U-specs concept was created by a team of Dutch scientists led by Dr. Rob van der Heijde. The concept is based on the invention of Nobel Prize winning physicist Luis Alvarez. U-specs are universal spectacles that can be adjusted by users to suit their own eyesight. The U-specs’ lenses consist of two parts that can slide in opposite directions, changing the lens power. Users adjust the power by turning a dial. Once clear vision is attained, the lens power is fixed, and U-specs are ready to wear. In order to illustrate how U-specs work and to get attention to the project, Novocortex created a display ad (in collaboration with Red Graphic). This banner ad received the Golden Hammer award at the Baltic Sea advertising festival and the Golden Apple award in Russia, both awards in the Online Advertising category. You can experience how U-specs correct low vision by adjusting sharpness of the banner with your mouse. You need Flash to view the banner. In 2008, U-specs were tested in India in co-operation with Philips and Indian eye clinics. 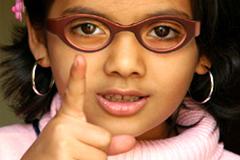 Since 2008, U-specs were provided to children with myopia in India, Guatemala, Nigeria and Rwanda.